Soft & creamy heavenly taste in just a few easy steps. Would you like to make a cake and don’t event touch a flour or the oven? Are you craving something refreshing, fruity & creamy? Do you love fruit & soft pastry? Well then this recipe is exactly what you are looking for. OR: Low-fat natural yogurt for lighter version / Soya yogurt for vegetarians. Same as with soups & salads – amount of ingredients are adjustable to your liking. Having a bit more ingredients, is better than rushing to the shop in the middle of cooking process :). Try & see what is the best exact amount of ingredients and container that suits you best. Now you may proceed with your creation – the base – a first layer should be always made of sponge biscuits covered with the thick mixture. Cut bananas – slice off round thin coins by cutting it crosswise. Same with strawberries. To achieve a delicate taste, slices should not be thicker than 2-3mm. Place fruits evenly over the cream layer, covering a whole area. Try to make layers as even as possible. After maximum 2 of fruit layers cover it with a thinner mixture (covering all the gaps). Repeat this steps until you fill the container almost to the brim. Make sure that the last layer is a thick mixture. Now you can unleash your imagination and decorate, with the rest you the fruits, chocolate, honey or jam. Tadaaa, DONE but don’t get too excited, you have to cover up, this creation of perfection, and put it in the fridge. Hah painful after all that effort I know! In order for layers to blend nicely leave it in the fridge at least over night, although 24h is better. The only problem is, that tomorrow you will wish that you have made MORE of it, that’s my promise! Sample: My cake layers – sponge biscuits – thick mixture – banana – strawberry – thin mixture – sponge biscuits – chocolate mixture – banana – blueberries – thin mixture – sponge biscuits – thick mixture – fruit decoration. The best it looks in a big glass bowl for sure – when all layers are nicely visible. Go for it if you are expecting guests. Depends on the size and types of dishes – serve it cold & cut it OR just grab the spoon & dig in! Well 3500cal. or 3000cal., forget about that for now, close your eyes, turn off your brain and enjoy this fruity soft goodness :) Fruit is good! I’ve used round sponge biscuits made by Czech company “Opavia”. In Czech and Slovakia they are called “Piškoty”. You can find them in London as well, in Polish or Czech/Slovakian shops in North London. This delicious sponge biscuits are basically melting in your month. That’s why they are also called Children sponge biscuits – babies with no teeth love to mumble on them. Once you start chewing those, you simply can’t stop :) History of “Opavska” factory begins in 1840, when the local weaver Kaspar Melhior Baltasar Fiedor with his wife founded the company called “Fiedor” producing wafers, including wafers with a round shape, unique back then. Now known as a “Fidorka“, one of mine favourite and still on the market btw. Impressive! Small, round, crunchy, chocolate thingy… mmm, YumYum! 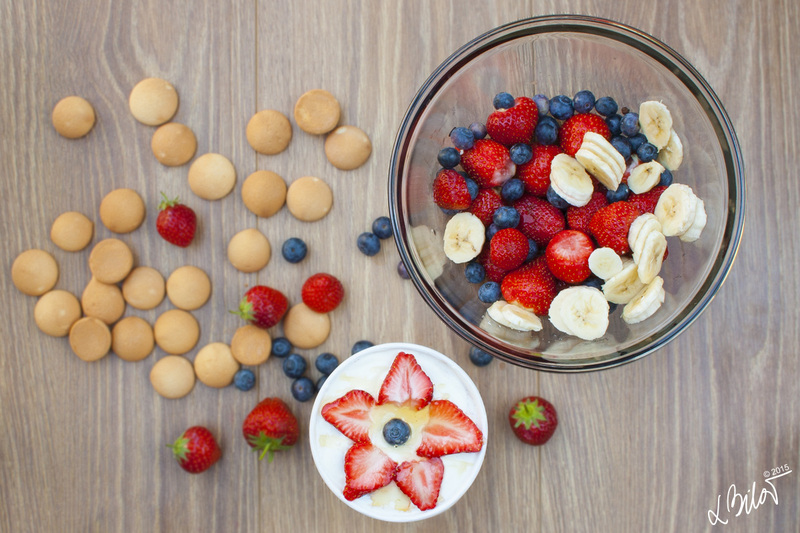 Round sponge biscuits, bananas, strawberries, blueberries, sour cream, honey, glass bowl, soup cups from our canteen. So as the cake so is she he he – Yum! I may use you as my test buddies… I will feed you with some of mine delicacies & you can fill my blog with encouraging & funny comments! Win, win! BTW guys dont be shy – share your photos / experience with me, once you try this recipe.